These are fish tanks in the Ark as it is now. Color Photos of the Ark are courtesy of Earl Barnhart, former and current New Alchemist, and current resident. 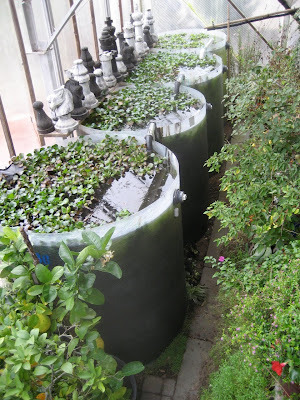 Notice the plants floating on the tank surfaces, and the pipes between tanks. Both work to keep the water clean. The plants take up fish waste through their roots. water from the tanks will cycle through filters and pH-balancing media (gravel or shell).